This is a public relations nightmare. Worse than when a West Point grad and JAG officer was arrested by the FBI for sodomizing his infant son and recording the act on video. You can read all about it in the RSB below. So far, the PAO shop has been lucky. The mass murdered in Las Vegas has grabbed up most of the headlines. But that may be about to come to an end. 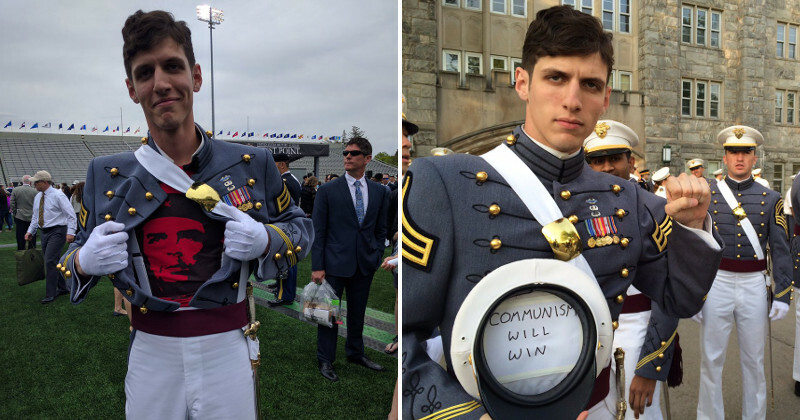 The disturbing case of Commie cadet and now 2LT Spencer Rapone is not going away anytime soon. 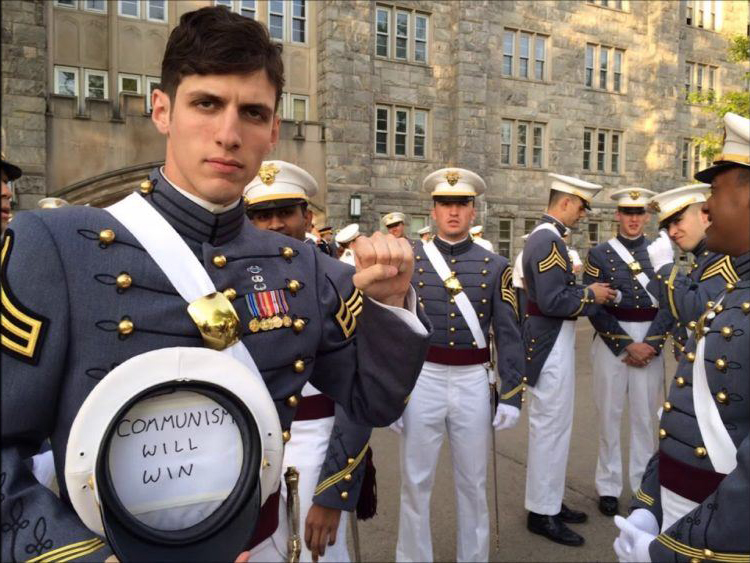 Some of you will recall he’s the leftist punk who wrote inside his saucer cap “Communism will win,” flashed the slogan at his 2016 USMA graduation and gave the clenched fist “salute.” In another in-your-face pix, he is shown unbuttoning his uniform tunic to reveal a t-shirt emblazoned with the face of Cuban killer Che Guevara. It’s bad enough that such scum exist in our military, let alone at West Point, but now it has come to our attention that Rapone is not alone in his dangerous political views. We’re not ready to print names, yet. And we wouldn’t want to short-circuit any legitimate CID investigation to root them out. We can say, however, that one of them is a female graduate. That’s not all that needs covering up (sarcasm intended). Check out the photos that accompany this article and you will see a strange figure – Dr. Rasheed Hosein – in an embrace with Rapone. 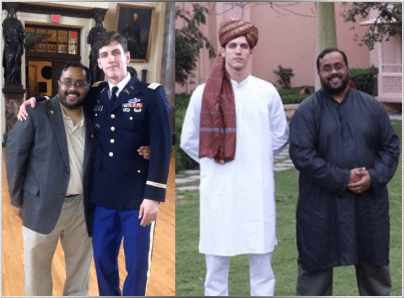 The Muslim faculty member has been “mentor” to the Communist officer since his third year at West Point. Does the turban and robe remind you of another mystery man in a similar pose? 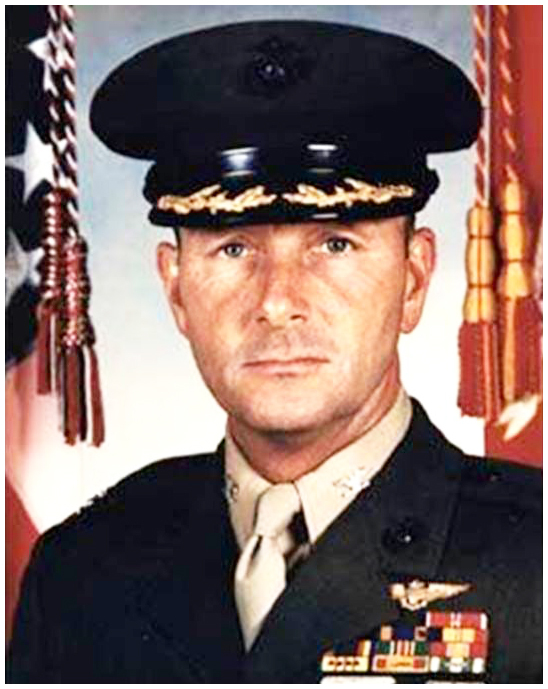 One who nearly destroyed the U.S. military on his watch. 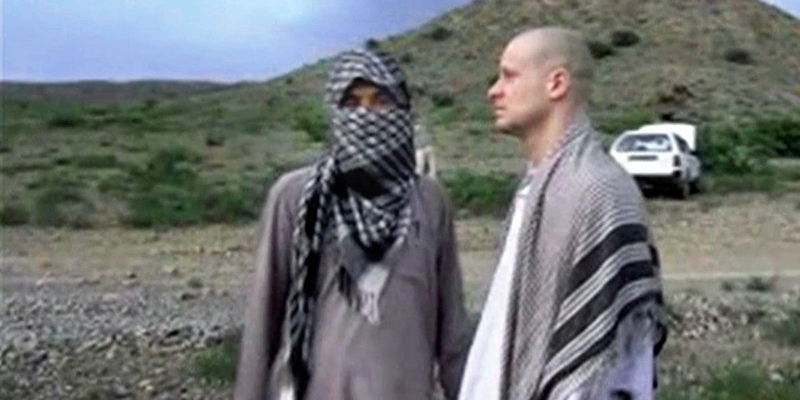 Did Hosein “radicalize” Rapone and turn him into a ISIS-type sleeper agent? What person in their right mind would taunt President Trump and SECDEF James “Mad Dog” Mattis, whom the lieutenant tweeted was “a vile, evil f**k.” Why is he in his comfort zone despite going way over the line? As soon as the photos went viral online, the West Point “leadership” came out with a watered-down, wimpy statement saying Rapone’s remarks “in no way” represented the views of the USMA and allowed that authorities at West Point would “look into” any violations the butter bar made of the UCMJ (Uniform Code of Military Justice). We do know this, if Rapone is not sufficiently disciplined for what he has done, the Army itself will collapse from within. WEST POINT HAS GONE TO HELL!